We are going to the original country. We are going to the country our ancestors walked out of to populate the world. We are going to the roots of Christianity. We are going to Ethiopia. We are going to Axum, the capital of the ancient Abyssinia, and its dusty markets. We are going to see the churches hewn out of rock at Lalibela. But we are going, also, to a country at a crucial and exciting moment. In a few short months, new young Prime Minister Abiy Ahem has ended the 20-year war with Eritrea. Ethiopia is the hub of the African Union; Ethiopian Airlines is one of the world’s most impressive airlines; its dam project, largely funded by mum and dad Ethiopians, will export power far and wide. We are going to the source of the Blue Nile. As you might have gathered by now, I am only planning and leading Travel Club Tours to places for which I have a particular affinity. India, Madagascar, Oman, and there will be Antarctica next year. They rather speak for themselves. 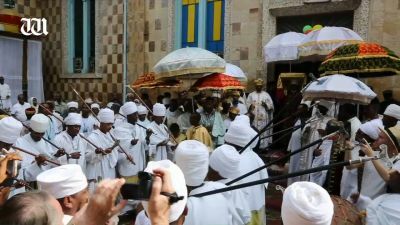 And I love leading Travel Club Tours to places where I have particular friends, and in Ethiopia that is particularly Firew Ayele. I wouldn’t be going there with a group without Firew, who lives in Addis Ababa. He is one of the most remarkable people I have the good fortune to know. He’s a geographer, a historian, and a great and knowledgeable storyteller. He has the most incredible life story. He is one of the kindest, most generous men I have ever met. I wouldn’t do all this without partnering with a trusted company, and that is Travel Directors. I met Firew through Travel Directors’ principal Tony Evans, who married Ethiopian Helen Seraw and now lives in Gondar. We will meet him there, and spend time with Helen and her sisters — Tena and Senait Seraw, and Aden Atenafau, at their The Four Sisters restaurant. The Ethiopian journey begins with “somewhere new”, as we have decided to fly in to Dire Dawa, where we will visit four UNESCO Heritage sites and see the hyena men feeding the hyenas. We will then take the new train to Addis Ababa — giving views of the landscape that even I haven’t seen before. The trip includes time in Axum, the old capital of Abyssinia and Lalibela, with its rock-hewn churches. I can’t wait to be in Ethiopia. I can’t wait to be with Firew. And maybe I’ll be with you, too. Ethiopia might be described as the original country — the country in which our human ancestors developed, and which they walked out of, and where there is the longest evidence of our evolution. Drawing on a history filled with adventure and mystery, a journey to the Blue Nile Falls reveals unheralded and surprising sides of the celebrated river.